With thousands of options to plant in your garden, selecting the right tomato can be a little overwhelming. Burpee has removed most of the guesswork by selecting the best tried-and-true varieties, but some tomatoes are better for specific uses than others. There’s a tomato for every kind of recipe and taste! 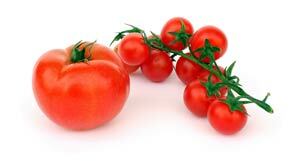 Here’s some foolproof charts and tools showing the best uses for your Burpee tomatoes. This is how long it will take your vegetables and herbs to grow and ripen under the best conditions. Determinate (DET) : Bush-type tomato. It blossoms and fruit develop on the vine at the same time. The harvest time is short (7 to 20 days). Plants are self-topping and seldom need staking; best when caged. Indeterminate (IND) : Pole or stake-type tomato. It blossoms and fruits progressively and the harvest lasts for several months, usually until the frost; best when staked. Dwarf-Indeterminate (DWF-IND) : Compact indeterminate. The plant height will be restricted, however it will continue to blossom and fruit longer into the season; best when caged. This list is A to Z all the tomatoes offered as Burpee plants. Select a tab to filter your list. Meaty and firm. Best for salads and sandwiches. Sweet and solid. Ideal for salads and fresh snacking. Unique and flavorful. Impressive on their own. Dense and meaty. Perfect for sauces and salsa. Plump and versatile. Great on burgers and sandwiches.